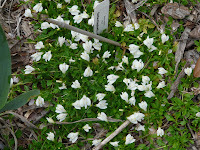 My gardens are waking up for spring, and I've been captured, again, by this lovely groundcover. First, the down and dirty. This little plant is hardy from zn 5-8, and does well in most conditions. I've got some growing in full sun, but I have a couple of plants in shaded areas. The full sun plants grow faster, but the ones in the shade do pretty well, too. It likes it wet, but it's taken the recent drought years like a man and made significant progress. The leaves are small, usually less than 1" long, tear shaped with scalloped edges. The leaves grow in little clumps and send out runners in all directions. The foliage, here, in our warmer climate is actually evergreen, which is very nice when my perennial beds have quieted down for the winter. Due t o its 'running' nature, the plant is very easily propagated. Cuttings take readily, and it naturally layers itself as it crawls and spreads. Even better, it can take light foot traffic, making it a great choice for area where you've got stepping stones or occasionally have to trek. 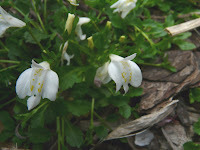 From early spring to late summer, the plant blooms with small (~1" long), unusual little flowers. The plant pictured is the white variety, but I also have a purple variety. A small amount of greenery can produce a huge number of flowers, and pollinators flock to this little lovely all year. 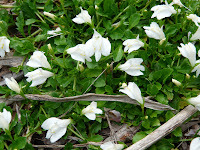 Now, we all know that a lot of groundcovers tend towards the invasive, but this little guy is very friendly. It grows dense enough to act as a living mulch, but it doesn't choke out plants, which makes it a great companion for areas where my bulbs are. It spreads readily, but it's not so fast that it's difficult to control.